Human rights abuses: Panel invites Falana, Boko Haram lawyers – Royal Times of Nigeria. 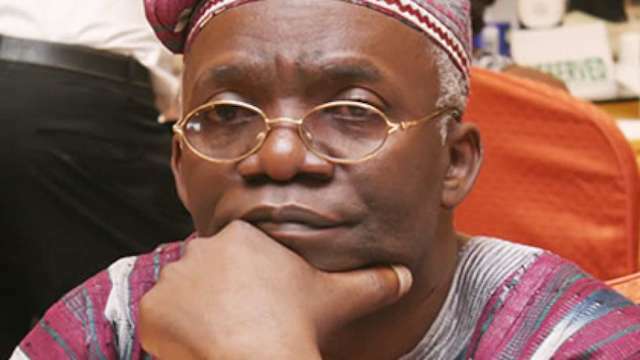 Presidential Panel investigating alleged human rights abuses by the Armed Forces has called on Mr Femi Falana (SAN) and all lawyers representing suspected Boko Haram members detained in the Southwest to come forward to present their case before the panel. The Chairman of the eight-man panel, Justice Biobel Goodwill of the Court of Appeal, made the call on Tuesday on the second day of the panel’s sitting at the Ikeja High Court, Lagos. “Mr Femi Falana and other counsel should come forward with their allegations of human rights abuses. “It is imperative that people in Southwest with allegations against the armed forces should appear before the panel,” Goodwill said. The judge also invited interested parties to join members of the panel to a one-day fact finding mission on Oct. 25 to the Kirikiri Maximum Prisons, Lagos, where alleged Boko-Haram suspects are incarcerated. Vice-President Yemi Osinbajo had on Aug. 11 inaugurated presidential investigation panels to review compliance of the armed forces with human rights obligations and rules of engagement in conflict and insurgency cases. The panels are to sit in the six geopolitical zones and the Federal Capital Territory from Sept. 11 to Nov. 3. During Tuesday’s proceedings, the Nigerian Army through their counsel, Mr Bola Oyebanji apologised to the family of Mr Abubakar Alhaji, a commercial motorcyclist who was allegedly beaten to death by Sgt. Taiwo Owoeye, a soldier in Lagos. “The Nigerian Army has detained Sgt. Owoeye for murder, we find the matter reprehensible and condemnable. “However, this is a single act which showed that the sergeant was on his own. “We apologise and sympathise with the family of the deceased,” Oyebanji said. Justice Goodwill also , giving his condolences, told brother of the deceased “apologies to you and your family for the death of your brother”. Goodwill after tendering the apology, told Mr Lucas Koyejo, a counsel from the National Human Rights Commission to follow up with the military trial of Owoeye to ensure that justice is done and to liaise with the victim’s family. Earlier, Alhaji’s brother Mr Salihu Mojahid, in his testimony before the panel, shed light on the series of events leading to his brother’s death. Mojahid said: “On Feb. 27, my brother called Abubakar Alhaji, a commercial motorcyclist, took a passenger to Maroko Roundabout beside Myhoung Barracks, Yaba, Lagos. “He parked at the back of a vehicle and unknown to him someone was in the vehicle, the person in the vehicle reversed and bystanders shouted that a commercial motorcyclist is behind him. “My brother knocked on the car to alert the owner that he parked behind him, the owner of the car came out and he was Sgt. Taiwo Owoeye. “Owoeye who was in full military uniform, slapped my brother twice and after he fell down, and he started kicking my brother several times in his stomach while he was on the ground. “Bystanders tried apologising to him but he refused to listen to them till my brother fell unconscious. “When my brother became unconscious, he wanted to leave and the bystanders said ‘do you not see the state of the person you have beaten up? “Sgt. Owoeye told them ‘let him die, even if he dies, nothing will happen’. “Fellow commercial motorcyclists and military men took him to a hospital in the barracks , he was vomiting blood till the next day. Mojahid claimed that his brother’s corpse was not released to the family until May 25 which was four months after the incident. The panel had during its proceedings dismissed a petition by Mr Mohammed Okorie who was accused of treason, unlawful possession of firearms and conspiring to blow up a presidential aircraft with some accomplices in 2004. “I was wrongfully accused of being a missile importer. 76 military officers were arrested when I was also arrested. “A military plane was sent from Nigeria to Ghana, Lome and even Ivory Coast in connection with the charges,” Okorie claimed. Okorie through his lawyer, Mr Charles Nzeagbuna, challenged his incarceration by the military, stating that he was subjected to inhumane treatment and torture during the four years he was in custody. However, the Army, disputed Okorie’s claims noting that he was arrested on the orders of the Department of State Security (DSS) and not the military and an investigation of his case was conducted by a special panel created by the Federal Government. Dismissing the petition, Justice Georgewill said Okorie’s petition did not fall within the terms of reference of the panel. “The situation weaved around this panel does not apply to the charges of treason and felony. “This situation in reality does not fall within the five terms of reference which is restricted to conflict and insurgency scenarios. “Arrests in regards to a felony does not fall under the jurisdiction of this panel; this panel lacks the jurisdiction to entertain this case,” he ruled. The panel also dismissed the petition of Mr Anthony Azuibike on the grounds that his petition did not also fall within its terms of reference. Azuibike in his petition against the Nigerian Military claimed that they unlawfully evicted him from a land he had bought from an army Commandant. The piece of land on which he had built his home was located at Peace Estate, Command Road, Ipaja, Lagos. He claimed that the military infringed on his rights by evicting him from the property, rendering him homeless and subjecting him to torture. Azuibike had demanded N200 million damages from the military.